Italian car sales continued to fall in 2013. Total PC market fell 7% as a consequence of the financial crisis, unemployment problems and uncertainty about immediate future. Here there are the main insights about last year results. 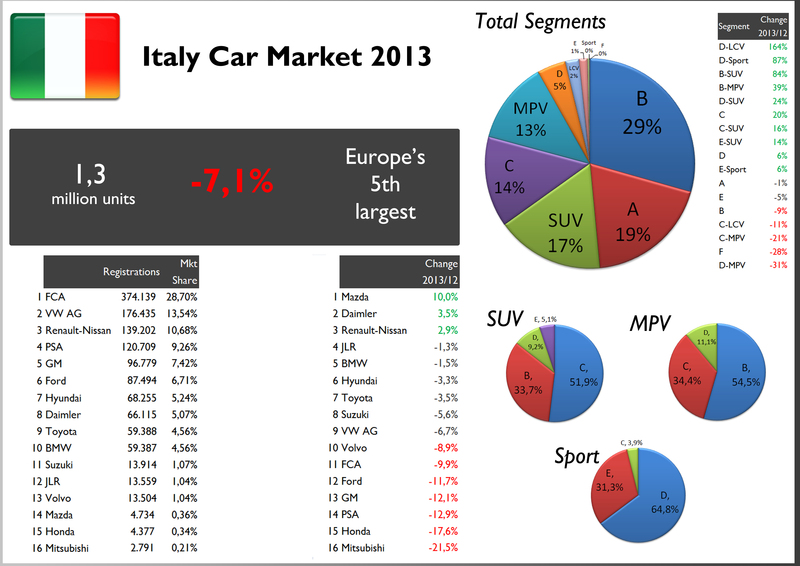 Italy is now Europe’s 5th largest car market, if Russia is included. Last year only 1,3 million units were sold, half the number sold in 2007. 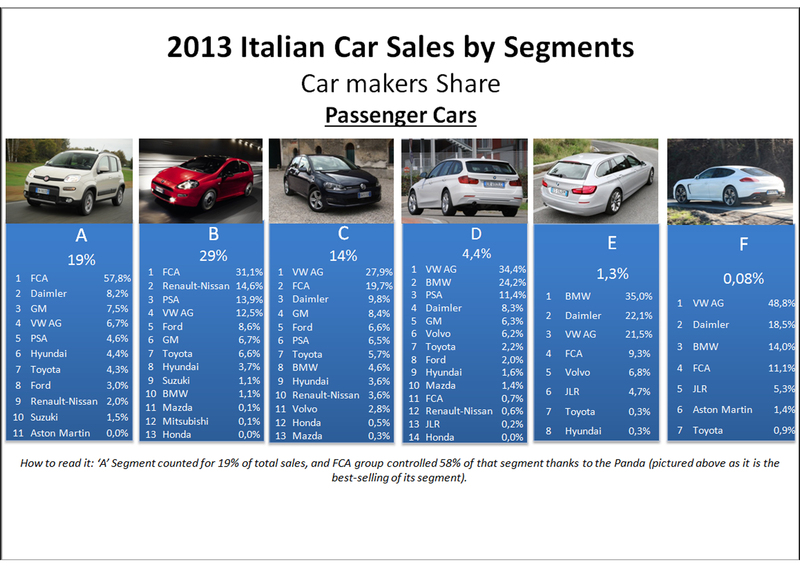 Italians prefer small cars as almost 50% of the market correspond to city cars and B-segment hatchs. However, SUVs continued to gain share thanks to the small ones. 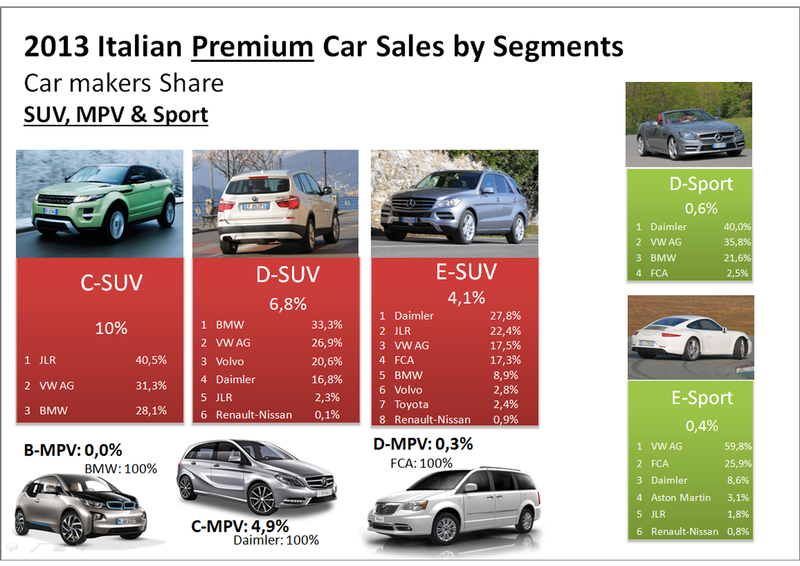 As it happened in France, Italian consumer is shifting from regular B-Segment to B-SUV. MPVs surged thanks exclusively to the Fiat 500L, but it is a segment that loses share. FCA rules with an important advantage. Nevertheless, its share fell and is still far from Renault/PSA in France and VW in Germany. Ford, GM and PSA are the biggest losers of 2013. FCA posted a fall which is larger than overall market’s. Therefore its market share was reduced in almost 1 bp. Italy ranks third as FCA’s largest market in 2013. 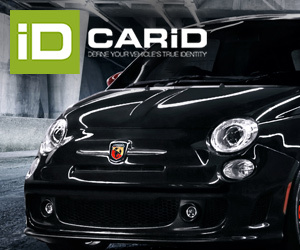 Fiat brand counts for almost 3/4 of the group’s PC sales. It was the best performer brand among the big ones as it sales only fell 5% thanks mainly to the 500L minivan. Lancia and Alfa Romeo had very bad results as a consequence of an old range and more aggressive German rivals. 70% of the group’s sales is concentrated in A and B segments. That’s quite a lot and can be considered as dangerous. The 500 gets old, the Panda isn’t as popular as the previous generation, and the Punto is about to die. Thanks to the 500L, FCA offset the fall in sales in C and B segments, but it wasn’t enough. Very low presence in SUV segments. The Panda was the group’s and Italy’s best-selling car for the third year in a row. The rock star was the 500L which during its first full year of sales, became the group’s 5th best-selling product and the absolute leader of its segment. The Ypsilon was the other major product to rise its sales registrations despite the arrival of the new Renault Clio, Peugeot 208, Toyota Yaris and some others. The 500 impresses despite its age and the arrival of VW in that segment. The Panda, Giulietta and Punto didn’t perform good. 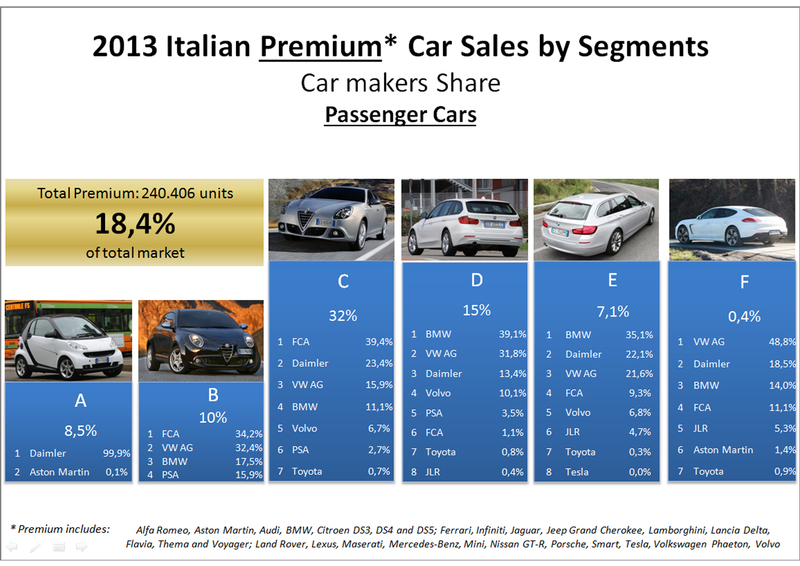 Once again the Fiat Freemont was FCA’s product with the highest share within its segment. The Panda now controls 40% of A-Segment (against 47% in 2012). FCA rules because of its important position in A and B Segments. But VW group comes at second place because of its leadership in mid size segments (C and D). Notice that Daimler, thanks to the Smart outsold other mainstream car makers such as Opel, VW and PSA. 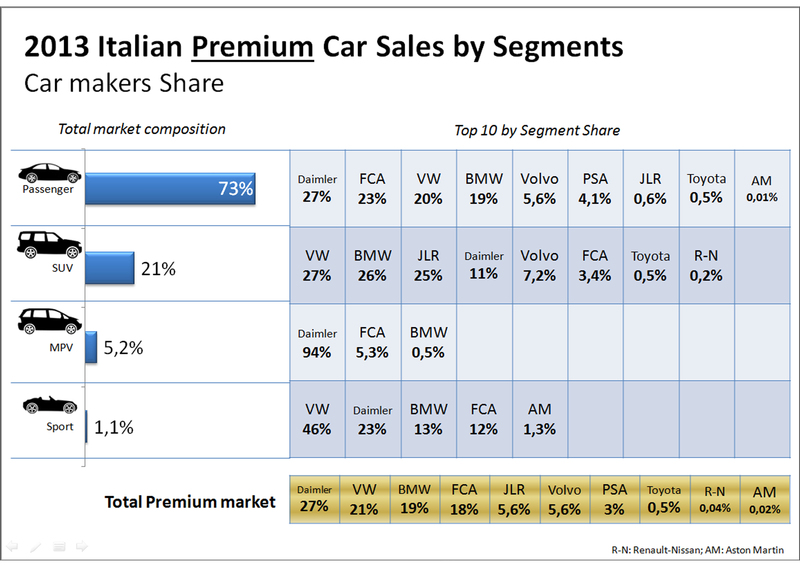 Notice also that VW group occupies the 4th place in B-Segment after Renault-Nissan (the new Clio is quite popular in Italy) and PSA. With only one model (A-Class/CLA) Daimler outsold Opel, Ford and PSA in the massive C-Segment. German premiums reign in larger segments but is Porsche the rock star of the year, which placed the Panamera in the first place among luxury sedans. Renault-Nissan plays an important role in the sales-increasing SUV segment. Thanks to the Juke, Duster and Captur the French-Japanese group leads in B-SUV segment by far. The Qashqai does the same in the largest SUV segment by volume: C.
B-SUV segment is now bigger than the d-Segment. German premiums control the upper SUV segment but FCA has an important share in E-SUV thanks to the Grand Cherokee, the second best-selling large SUV in Italy in 2013. 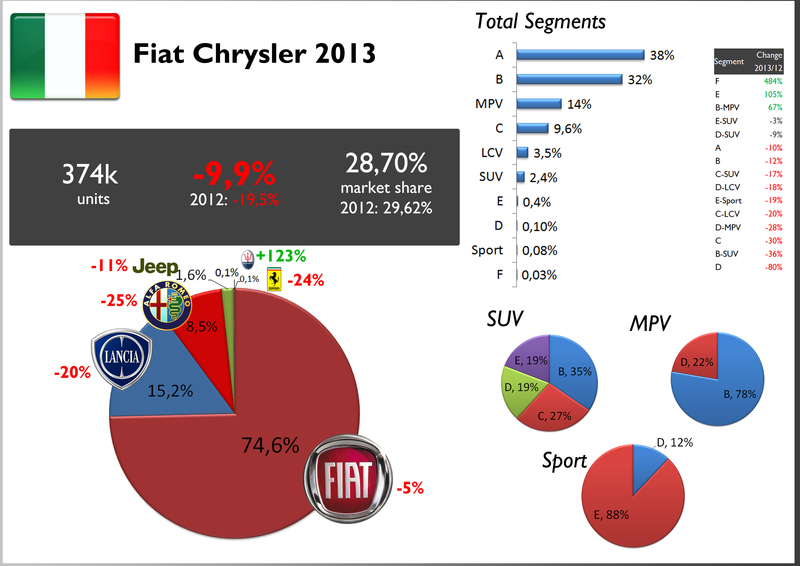 FCA reigns in the MPV segment thanks to the 500L and Freemont. Ford controls the mid-size segment thanks to the C-Max, which outsold the Scenic, Zafira and Touran. The B-Class is very popular in Italy. Thanks to Porsche, VW group is the best-seller car maker in the Sport segments. Ferraris and Maseratis were that not popular due to tax issues. 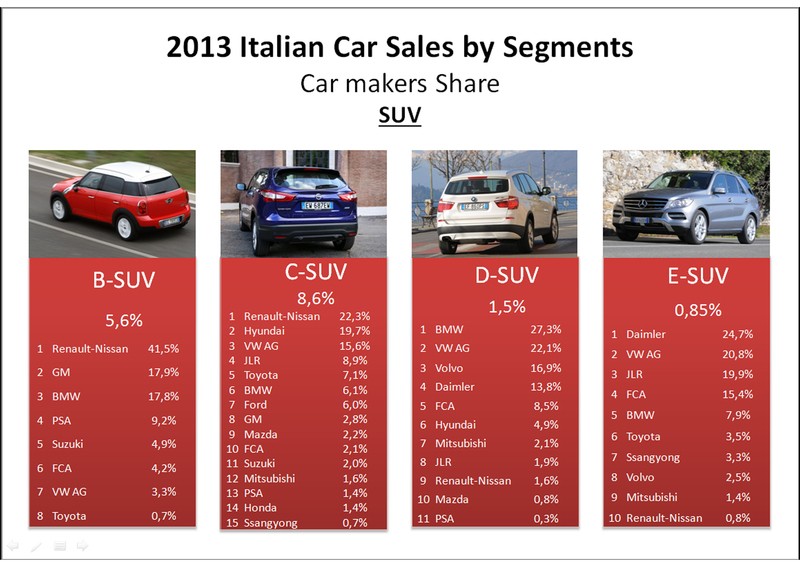 Italians prefer regular passenger cars instead of SUVs and MPVs. FCA rules in 3 out of 5 major segments. VW comes next thanks to its good performance in passenger car segment and SUVs. 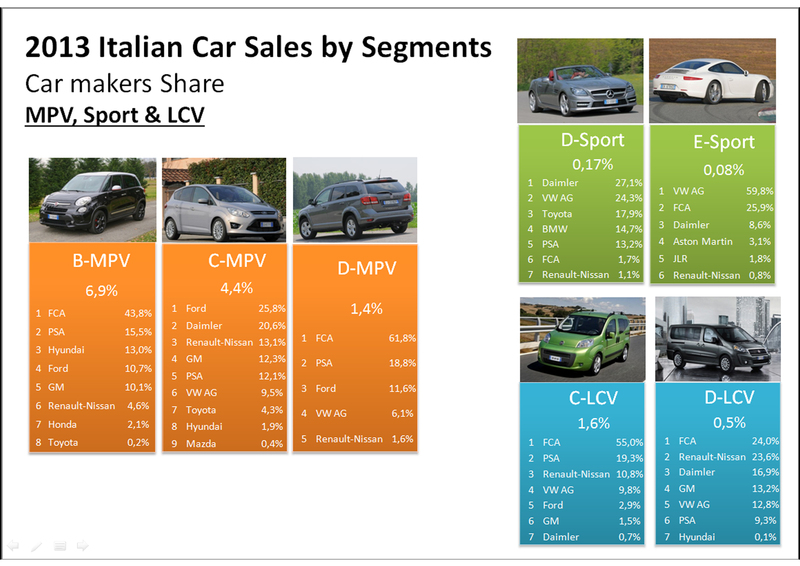 Renault-Nissan leads in the SUV segment by far, while FCA as a local is quite small. Premium segment counted for 18% of total market. That’s not bad considering the high prices of this kind of cars. 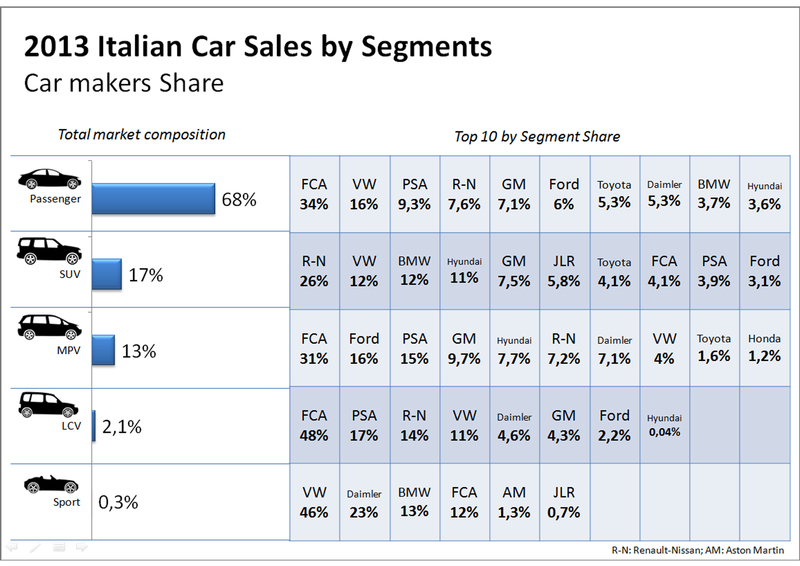 Of course the Germans lead in the upper segments, despite FCA try with Maserati. 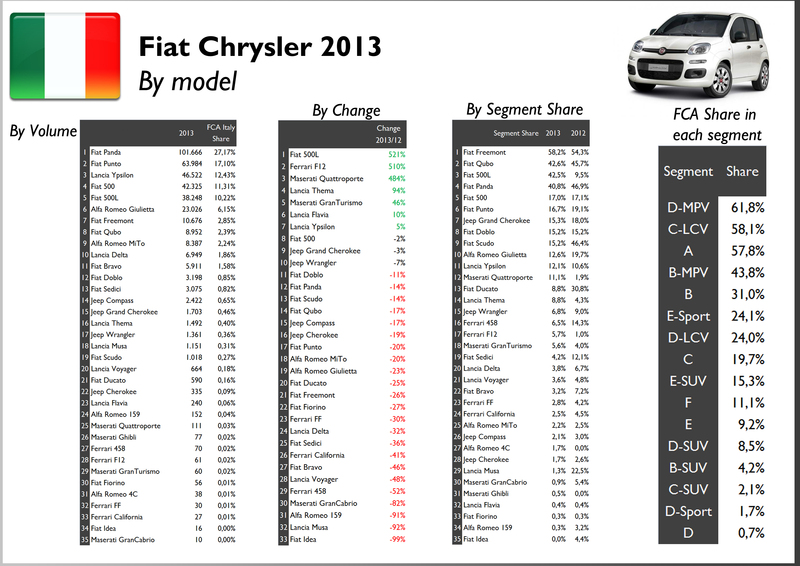 FCA heads the rankings in B and C segment thanks to Alfa Romeo. Nevertheless the new A-Class from Mercedes occupied a decent second place in the C-Segment, ahead of the Audi A3 and BMW 1-Series. In the SUV premium market BMW and Jaguar-Land Rover occupied important positions. The Evoque is the most popular compact premium SUV, while the big Range Rovers are ahead of the VW, Porsche and Audi. The Jeep Grand Cherokee (positioned as a premium SUV in Europe) allowed FCA to be in a decent fourth position in E-SUV segment. In the Sport segment the Germans clearly reign. The Porsche 911 is the most popular high end sporty car, ahead of the expensive Ferraris and Maseratis. Alfa Romeo and Maserati allowed FCA to be in the fourth place as a premium choice. Of course the German trio command. JLR and Volvo are better positioned than Lexus, Infiniti and Citroen’s DS range.